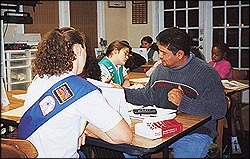 Community Learning Center volunteers include Girl Scouts trained in the Study Technology developed by L. Ron Hubbard. The World Literacy Crusade began in the aftermath of the Los Angeles riots of 1992, when Baptist minister Alfreddie Johnson decided that something needed to be done to save the young people from the violence-ravaged South Central LA community. Using Hubbard’s study technology, World Literacy Crusade tutors assisted low-achieving public school students to improve reading and math skills. The average reading grade level increased by eight months in just seven weeks of part-time tutoring. Math tests improved 10 percentage points in the same time period. Since then, the program has expanded to other cities around the world, including Clearwater and Miami and results are repeated wherever a center is opened. Here in Pinellas County, the local chapter of the World Literacy Crusade, the Community Learning Center, opened in Clearwater in 1998 by Holly and Brendan Haggerty. After meeting the Rev. Johnson in Clearwater, and having run a successful youth literacy initiative in Minneapolis in the early 1990’s, they decided that they would continue this work in the Tampa Bay area. The CLC is a family learning center, with students who range in age from 5 to 65. This center offers tutoring and tutor training to mainly low-income families who enroll in the program because of poor reading scores in school or difficulty in life due to poor reading skills. “When a student first enters the center, they are tested to determine their level of literacy and an individual program is developed for them based on their needs,” said CLC Founder Holly Haggarty. Once the students are able to read, and know the basics of how to study, they are directed to areas of their own interest to apply the reading and study skills that they have learned. For example, children participating in the Chaka Khan Art Club at CLC (founded by the reknowned singer-songwriter) learn the meanings of art terms and put them to use in creating visual and performing arts. Those who participate in the Chess Champions program learn the meanings of chess terms and apply them to learning chess. This literacy’s program’s effectiveness is measured by the increase in the student’s standardized test scores — word recognition, spelling and reading fluency are all tested. More importantly the effectiveness is seen in the students themselves. J.H. was considered gifted in Kindergarten. During his first grade year, however, he had tremendous difficulty in reading. He would frequently end up under a table in class, crying and having nose-bleeds. The school determined that he was reading disabled and that he needed to be tested for Attention Deficit Disorder, (ADD). In November of 2002 his mother brought him into the Community Learning Center. After about three weeks of tutoring, JH went from a primer level of reading to a first grade level. He was able to read the books required to pass first grade and it was determined that it was no longer necessary to test him for ADD. Another child, originally from Syria, completed first grade in May of 2002, but could not read even primary words such as cat or bat. His mother, who speaks English as a second language, began to tutor him at the Center. By the time summer began, he was reading at a primary level and was interested in reading. By August, he was easily reading first-grade material. When he returned to school this past fall, he was at the top of his second-grade class, even though he had only been in America for two years. He continued his tutoring and is now avidly reading at a third-grade level. The story is repeated in case after case. Because of the success of this systematic, step-by-step approach to literacy, CLC has been asked by other community groups to assist them in getting their own literacy programs off the ground. In this role the CLC partners with existing organizations and provides them with the materials, training and consultation they need to implement the program. Currently, the CLC is working with seven other organizations that serve over 130 students. These organizations range from two private schools for at-risk youth in St. Pete and Tampa, to a joint project with Even Start of Tampa Bay, working with young students in Ybor City. And as for that run-away boy who stumbled in off the street at the beginning of this article? He too learned to read and found his escape from the streets. Through the study technology of L. Ron Hubbard, as applied by those dedicated tutors and volunteers, the doors to education and that liberty that Thomas Jefferson spoke of became his. 1611 North Fort Harrison Ave.